It’s no wonder brands and influencers are interested in getting more Instagram followers. Instagram recently reached 800 million active monthly users – and the last 100 million were added in under six months! What are the 500 million active DAILY users doing on Instagram? Sure, we’re posting myriads of selfies, following Insta-celebrities and crazy-talented photographers. But, we’re also engaging with businesses. It’s clear to see – Instagrammers are open to engaging with the brands they follow! So, how’s a brand get more Instagram followers? Our most successful members use several techniques to keep their Instagram accounts growing. Some methods involve building engagement, and others involve specific ways to get discovered. Find the ones that make the most sense for you and give them a try! What’s that? You came here to grow your followers and not engagement, you say? Increasing your Instagram engagement can take you a long way towards reaching the goal of getting more followers. See, more engagement equals more exposure – even to people who don’t yet follow you. We have a whole post full of techniques to boost Instagram engagement. What follows are some of the top follower-boosting benefits to increasing your Instagram engagement. The “Top Results” spots for hashtag searches are determined by engagement. Instead of being pushed out of the “Most Recent” tab in a few minutes or hours, your image will get some quality exposure right at the top of the feed. To see the top results for a hashtag search, tap the “search” icon and enter your hashtag on the “Tags” tab. Tailwind for Instagram helps you find and select hashtags that can get you here. Choose a good mix of niche, competitive, better, and best for your best chances of being found in a hashtag search. Tap on the Search icon from Instagram and you’ll land on the Search & Explore tab. Here you’ll see stories, videos, and images – from accounts you are not following. If you can get your posts here, more people will find and follow you! Instagram doesn’t elaborate on why some content makes the cut and some doesn’t – engagement is a top algorithm factor in general. They were liked or otherwise engaged with by people you follow already. In both cases, the reason the posts ended up in my Search and Explore tab was engagement! Make an Appearance in the “Following” feed. Instagram’s Following Tab – See all the profiles and posts those you follow engage with. When you tap the heart icon, you’ll see the engagement on your posts. From there if you click on, “Following,” you’ll see the posts and profiles your connections engage with. When your followers engage with your content, your profile or photos can end up in the Following feed of your next best customer! When people see your thoughtful comments on the photos of those they follow, they may be inclined to check out your feed and follow you. You’re probably already doing this with brands and friends you like. But think about what other accounts your potential followers engage with. Comment on those accounts to put yourself on the radar of people who might follow you, too. Becoming irresistible will grow your engagement. But it will do more than that. Think about what you do when you discover a new Instagram account. You probably check out their bio (so make sure your Instagram Profile is great with these ideas) and then take in the overall look of the feed. Full of images so beautiful that we want them in our lives every day. The best accounts deliver all three. You can make your grid look gorgeous all the time with Tailwind’s grid preview. In fact, grab a free trial and then learn how to rock your grid and FORCE people to follow you! Don’t play the follow/unfollow game. We want real followers who are interested in our content and who will engage with it. In fact, using a bot to follow accounts in hopes of growing your own Instagram followers has been shown to be a losing strategy in more ways than one. Instead, follow some people who follow your competitors. Engage with their posts to get their attention. Beware of leaving comments that make you look like a bot, (“Nice feed!”), like you’re a bit too enthusiastic (#instastalker), or like you’re trying to sell. Be supportive and helpful. People who follow your blog or Facebook page may not even know you are on Instagram. Tell them! Better yet, give them a reason to follow you there. Does your Instagram account include behind-the-scenes glimpses into your creative process, announce sales, or share local landscapes? These are things you’re unlikely to share anywhere else – and could be just what it takes to make a new customer. Some blogs share their Instagram feeds right on the home page or sidebar. This is a great way to provide a preview of what they’ll get when they follow your Instagram account! @cynthianyongesa, The African Unicorn, includes this Instagram feed on her website’s home page. Do you have a brick and mortar business? A simple “we’re on Instagram” sticker could be all it takes to get new followers from store traffic. If you advertise on print, tv, or even billboards, include your Instagram handle there as well. Making good use of email marketing? Every once in a while, remind subscribers of what they’re missing if they don’t follow you on Instagram. With Instagram advertising, you can target the perfect audience of potential followers. Target those who like your competitors, are interested in products like yours, people who visit your site, or those on your email list. Your marketing objective here is Reach – getting in front of as many people as possible. Geotagging on Instagram can help local people find and follow you. Does your business have any kind of local component at all? When you add your geotag, people searching your location will spot your posts and may follow you. Or, they may just stop by your store! Learn how to effectively use geotagging on Instagram. Who is the person or business that all your customers look to for advice? Could you work with them to get your Instagram account in front of their followers? It could be as simple as asking them to regram one of your posts with a mention and a tag. Why would they want to do that for you? Well, unless they offer to share it with their audience out of the goodness of their hearts, you’ll need to sweeten the deal. After all, they’ve spent years building up their influence! If you have a similar following on Instagram, it may be enough to simply exchange regrams. Otherwise, you could offer to share their posts several times in exchange for their one share or vice versa. You could also approach them with a strictly monetary offer as well. If an influencer or company shares your post or otherwise promotes your content, product, or service in exchange for money or other material gain, they must disclose that the post is an #ad. Have you ever shared a quote from an influencer on Instagram? I know I have! When you do, make sure you tag the influencer. Not only does this give them the credit they deserve, but they may notice, follow you, and then people who are interested in them may follow you as well! Don’t do this JUST for an excuse to tag, though. Make sure your post is well thought out, puts the influencer in a good light, and is relevant to your account. Is there an influencer you trust enough to let them take over your account for a day? Creating posts, videos, stories, and live video to share with your followers will not only grow your engagement, but the influencer is likely to bring some of their own followers to the takeover. Many of them are likely to follow you, too! This works best for those with whom you’re partnering. Ideally, the takeover benefits them as well – or there’s always the option to pay! Again, they need to make it clear that they are being compensated for their participation. Your followers might be more than willing to tag a friend in a comment, thereby drawing their attention to your profile. Sometimes they just need to be reminded to do so! This can be as simple as adding “Tag a friend who needs this in their lives!” to your caption. According to a study by CoSchedule, 49% of people share social content because it’s useful or entertaining. Further, “… they say sharing allows them to inform others of products they care about and potentially change opinions or encourage action.” When a follower tags a friend, that’s an Instagram social share. So make sure your content fits that description – useful or entertaining. One of THE most useful and entertaining types of Instagram posts are contest posts! In fact, our study showed that those who use contests grow their following 70% faster than those who do not. One reason for the accelerated growth is that you can require entrants to tag a friend to enter. Get more ideas on using contests to grow your Instagram following. Want to win a StrongBoard Balance? 💪🏼 Enter the @jillianmichaelsworkoutjunkies giveaway! ・・・ 1️⃣ Follow us. 2️⃣ Follow @jillianmichaelsworkoutjunkies. 3️⃣ Tag a friend in the comments below for one entry. **Tag 3 or more friends for 10 entries. 4️⃣ Like this post ❤️ ・・・ The winner will be selected randomly from ours and Jillian Michaels Workout Junkies Instagram and Facebook comments, so make sure you can see yours below! ・・・ **Contest ends September 30th at midnight, & the winner will be announced the following week after confirming they meet the entry requirements. Good Luck! ・・・ This contest is in no way sponsored, endorsed, administered by or associated with Instagram or Facebook. Anyone can enter! This contest post gives entrants more entries for more tags! Remember to make your prize relevant to your product or service to attract the right audience. An original study by Tailwind analyzed over 100 thousand Instagram posts from a three-month period so see how posting frequency affected Instagram success. We found that you can nearly double your follower growth rate by moving from less than one post per week to 1-6 posts a week. You can more than double your follower growth rate again by moving from posting 1-6 times per week to once or more per day. It can be tough to come up with ideas and images for every day of the week, so we created our 30-day Instagram Jumpstart Challenge. Thirty days of Inspiration will get you in the habit and help you grow your followers fast! Join in today! 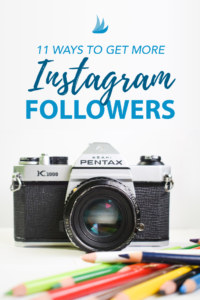 Growing your Instagram following is a great way to connect and build relationships with customers, potential customers, and influencers in your industry. Which will you try first?? Such useful info, thanks for this post.